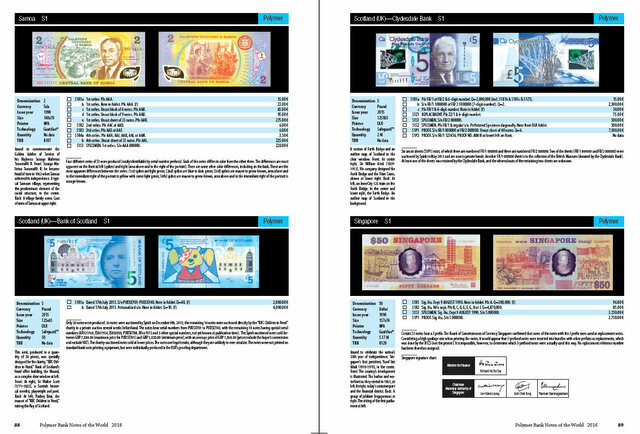 The 2016 edition of the award-winning Polymer Bank Notes of the World is the definitive reference on polymer and hybrid bank notes. Large A4 format, hard covers, over 200 pages in full color with 240 different issued and 113 different promotional & test notes on polymer and hybrid substrates. 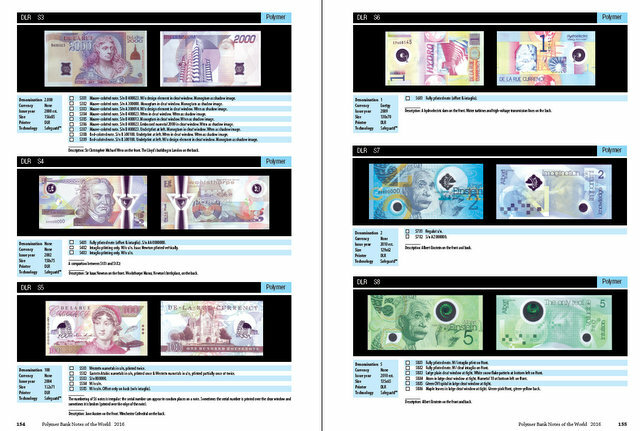 There are 4 sections: polymer issued notes, hybrid issued notes, promotional and test notes and a brand new section on folders. You can order it at Collectors site - Download Price List. Postal charges: There is a flat postal charge of €10.00 on all orders that include this catalog (over 1 kg in weight). Ordering 10 or more copies of the catalog? Please contact us at orders@polymernotes.org to discuss dealer pricing and/or show deliveries. 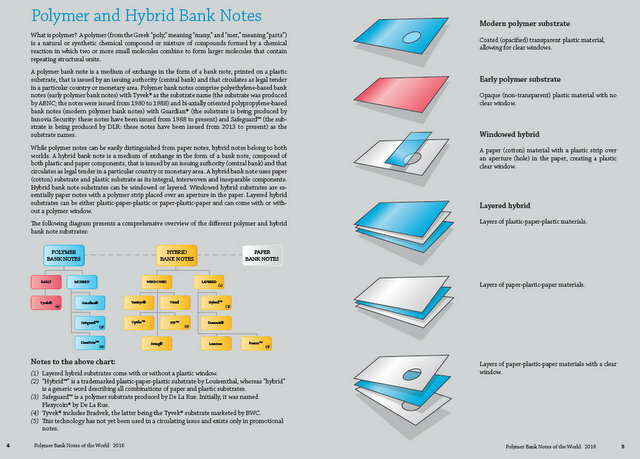 The definitive guide to polymer and hybrid bank notes. Large A4 format catalog, 144 pages in full color, listing 180 different issued and 82 different promotional & test notes on polymer and hybrid substrates. There are 1,574 entries (varieties) in the catalog with prices.This new edition is much enlarged and improved. 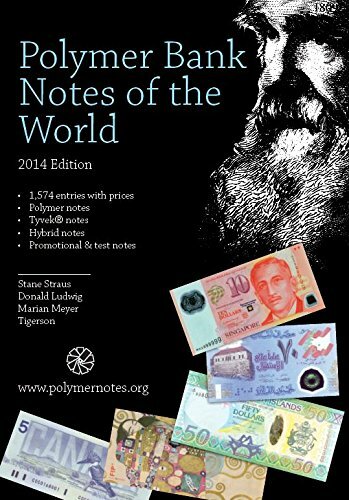 If you are interested in polymer and hybrid notes, this book is a must-have. 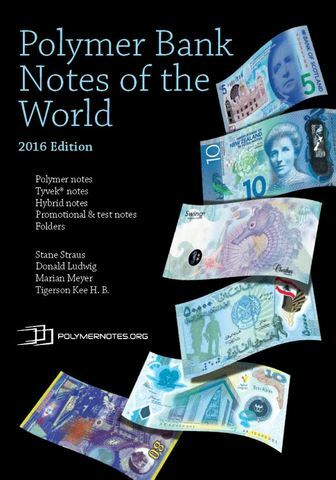 "Polymer Bank Notes of the World is the definitive guide to one of the hottest numismatic fields: non-paper notes, be they Tyvek, polymer, or hybrid (combinations of paper and polymer). The new 2014 edition uses larger format pages than the preceding 2012 edition, and has expanded from 122 pages to 144 pages, with coverage of an additional 285 entries of both issued and promotional/test notes (created by security printing firms to show off their prowess and new anti-counterfeiting features). If you're one of the many people with a penchant for polymer, this catalog belongs in your reference library (it's a bargain at only 20 euros), and the accompanying web site (http://www.polymernotes.org) should be a frequent stop as you browse the web for the latest information." 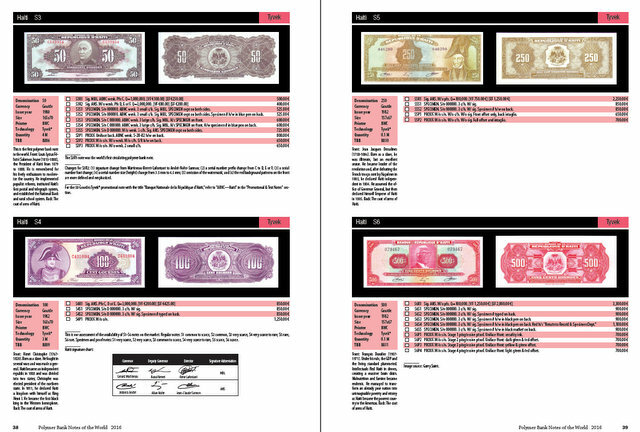 The first edition (2012) of Polymer Bank Notes of the World premiered at the 2012 Spring PaperMoneyFair in Valkenburg, Netherlands. 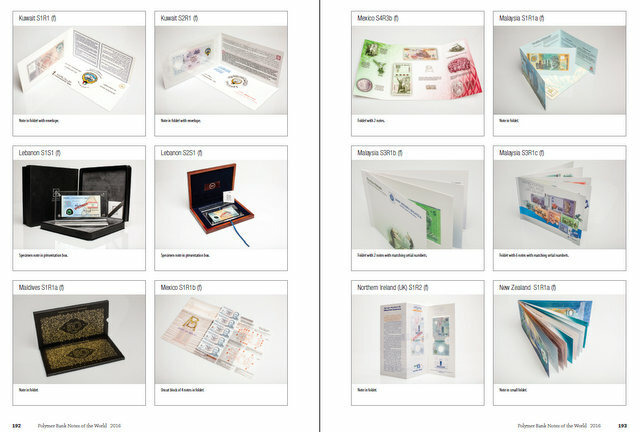 The catalog sold out and quickly established itself as the definitive reference for polymer and hybrid bank note collectors. It was published in a soft-cover format, containing 122 pages and cataloging 1,289 entries for polymer, Tyvek, hybrid and promotional notes - complete with prices for each variety. 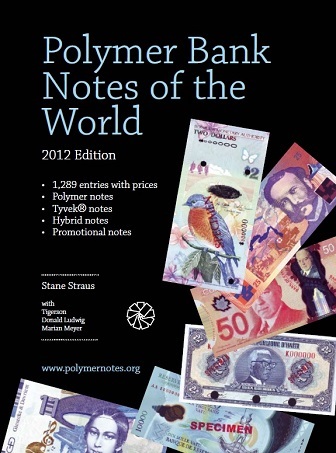 This edition was awarded "2012 Book of the Year - 2nd Place" by the IBNS (the International Bank Note Society).